Heroic effort sees Canopy project completed! Our spectacular new canopy on Platform 2 at Bolton Street station is now complete following the culmination of 18 months of teamwork. On Wednesday 2nd December a small ceremony at Bury Bolton Street Station took place to recognise charitable trusts and businesses that had been involved in the resurrection and were able to assist financially or through undertaking work for the project. The task was a phenomenal undertaking from when the first of the old steelwork was wrestled back to life back in July 2014, when the ‘first sod’ was cut on the platform 2 to receive the new columns, when we heard the devastating news about the collapse of our glazing supplier and the loss of £17,000 right up to now when our customers are able to enjoy the benefits of an all-weather amenity that is second to none, we would suggest, anywhere on any UK heritage railway. A huge debt of gratitude is owed to our Civil Engineering team who have laboured through the climatic vagaries over the past 8 months and who have been confronted by so many technical problems during the build. It is they who have made sure the new structure was complete in time to meet the oncoming winter weather and to give us that much needed extra space to welcome more visitors to the railway in the future. Thank you to all those that helped with the project. We certainly Raised the Roof! Now we will look towards our next canopy project at Rawtenstall… More details will be announced soon. Work to complete the boiler restoration of 80097 is moving at pace in order for it to return to the ELR during November. 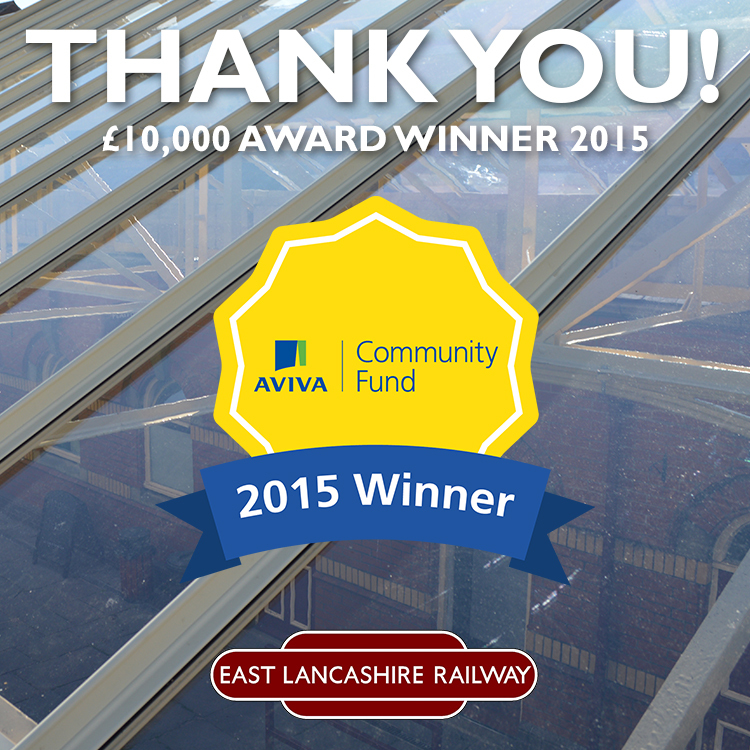 The East Lancashire Railway’s ‘Raising for Glazing’ has been chosen as a winner in the Aviva Community Fund and has been awarded £10,000! The railway is “over the moon” with the award and couldn’t be happier in receiving the donation, however the award wouldn’t have been possible without the support of our members, visitors and followers who all took the time to vote for us in the first instance. Over 10,000 votes were received for the project which stood the railway in good stead in getting through to the finals before more work was needed in order to stand a chance in being selected as a winner. An elated Fundraising Coordinator, Richard Barnett said “The award means such much to everyone here at the railway. The money will be used to pay towards funding the glazing that is currently being fitted to the canopy roof which will be completed in the next two weeks in time for our annual fundraising event ‘Raise the Roof’. £15,000 award received from Awdry Charitable Trusts! The platform 2 canopy project is steaming forward to completion following the substantial grant of £14,000 from the Hilary Awdry Charitable Trust followed by a further grant of £1,000 from the Veronica Awdry Charitable Trust. The grant came following an approach during March to assist with the funding of the canopy’s completion in order to see it partially completed by the annual Raise the Roof music event. Today the final piece of canopy structure was lowered into by the railway’s own 100 ton crane. The steelwork construction phase of the project reached its climax as volunteers bolted the final piece into place to the delight of all that watched the work taking place.